The land of Frazzledom is probably familiar territory for the best of us. 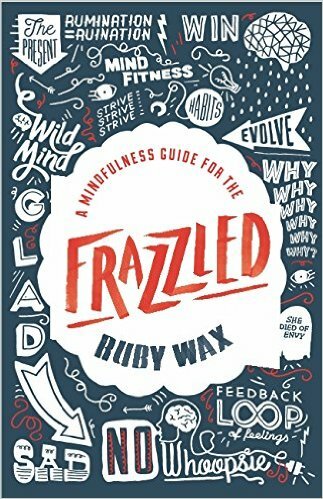 Everyday stresses are a constant companion, and In this semi-autobiography slash self-help guide, Ruby Wax attempts help us de-frazzle with an introduction to mindful psychology. With a masters degree in mindfulness-based cognitive therapy, Wax certainly knows what she’s talking about. In this book, she delves into the science behind mindfulness, the interesting tidbits of neurobiology and how our brains have evolved (or entirely failed to). It was refreshing to learn about the science behind the mind in an accessible way, mixed in with Wax’s little analogies and honest humour. This book definitely taught me a lot about my own silly little brain, and though I’m well-versed in mindfulness ideology and techniques, I still appreciated the reminders and the handy little exercises Wax provides for adults and children to try. Though I didn’t respond to Wax’s writing style (she writes, ironically, like she’s still frazzled), the content is all there. She breaks down exactly why mindfulness or cognitive therapy is beneficial, using her own life story as an example, and handily backs herself up with handfuls of scientific evidence. Wax relates that embracing consciousness, mindfulness, self-awareness and slowing down every day to take care of our minds and body is not only fantastic for your health, but it also makes you better at life. It helps you be more productive, more motivated, more sociable and happier. It’s about the importance of taking time out of our day to do something I’m sure we all want to be doing anyway: just spending time with ourselves, being ourselves and being aware of ourselves. A Mindfulness Guide for the Frazzled is a very decent beginner’s book for those new to the game, especially for the skeptics among us.